Hi ………At last India was able to achieve a consolation victory. The last time India successfully chased a target against Australia was way back in 1998, in Sharjah. Since then, India have attempted the task, 18 times, and failed on 15 occasions, with three matches, including the first game of this series in Bangalore, having no result. So it was really a great victory in that sense. 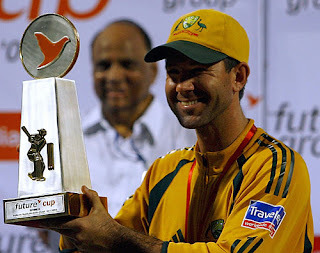 In Nagpur, India was to close to the victory. But India lost its way in the middle of the innings. After losing the wicket of Sachin and Saurav, (and then Pathan), downfall starts. With required runrate more than 7 runs per over Yuvraj and Dravid was not able to rotate the strike. In the process they lost their wickets and when Dhoni and Uthappa came the target was really out of reach…………….So, where the things went wrong. Though Ganguly was brilliant with bat, his strike rate suggest that India was chasing somewhere 275 not 318. India was 3-203 in 36 overs, requiring 115 more runs to win in 14 overs with 7 wickets in hand. Why, didn’t India start onslaught from that very moment, why they let pressure to build on them selves? We had their time in each match. All through this series, India have had Australia in some trouble early on. In the first game Australia went from 90 for 4 to 307. In the second they turned 66 for 3 into 306 and, in the third, 135 for 3 became 290. In the sixth game, Australia went from 129 for 4 to 317. Mumbai match was just a consolation win. Hats off to Murali Kathik and Zaheer Khan, both were brilliant with bat and ball. Apart from that their was really nothing to mention in Indian credit. Well 4-2 lost looks much better than 5-1 lost. Now India has to do some serious thinking regarding……. role of the seniors in the team (specially Dravid), batting order and fielding. Or else its really gonna be tough…….